Central to the BBC’s ambition for the World War One season is the desire to reintroduce audiences to a war they think they know. At the heart of that ambition is the BBC’s digital offer, bringing together the BBC’s TV and radio programming, news and features alongside exclusive, in-depth and interactive online content, allowing audiences to explore new perspectives on the war that changed everything. Today, we’re launching the first set of BBC iWonder interactive guides to support the BBC’s World War One season. iWonder is the new brand from the BBC designed to unlock the learning potential of all BBC content, curated by experts and BBC Talent. 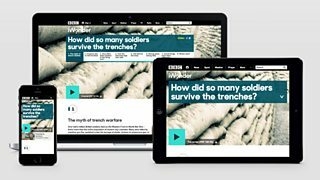 The first iWonder content is focused on World War One, but in time, iWonder will provide compelling content across all the BBC’s factual and education genres. When we started to plan the first set of interactive guides for World War One we focused on the common misconceptions around the War with the desire to challenge myths and perceptions. For example, we have developed a guide with Dan Snow around the widely held view that the majority of soldiers died in the trenches – the truth is that nearly 90% of soldiers survived war in the trenches. We have worked hard to collate content which will deepen audiences understanding of central war topics and with the first set of interactive guides, looking at how we think of generals, the role of women as well as looking at huge advances in medicine, the postal service and communications. 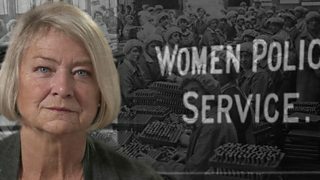 We have been lucky to work with some great talent across the World War One season including Kate Adie (pictured above), Ian McMillan, Frank Gardner, Alan Johnson and Shirley Williams. The iWonder interactive guides have given our presenters the chance to explore the themes within World War One which interest them the most. The process of creating the first set of iWonder guides has been fantastic, working with online production teams based in Glasgow, Cardiff and London. In the past week we have been have been filming with Gareth Malone for an interactive guide looking at how the popular song Pack up Your Troubles became the viral hit of World War One. The iWonder approach and interactive guide format is allowing us to explore a huge range of subject areas and we hope to publish over 100 World War One interactive guides through 2014. I am certain that the iWonder interactive guides will be a new and exciting way for the BBC to create compelling content. The format has been designed with BBC’s four screen strategy firmly in mind which means you can enjoy this great content whenever and wherever you are - whether you’re using a smartphone, tablet or desktop device.You can read more about the format of iWonder interactive guides from my colleague Andy Pipes’ post on the BBC Internet Blog. We’re very excited to share these new, content rich iWonder interactive guides with you and I hope that our audiences will enjoy using our iWonder guides to explore the war we think we know so well. See more of the new World War One iWonder guides on the BBC's World War One website. More information about the iWonder guides can be found on the Media Centre website. Controller Adrian Van Klaveren explained how the BBC's is marking the centenary of World War One in a post on the About the BBC Blog last year. He also highlighted some of this year's programming in a post published on 1 January this year. Watch the World War One season launch trailer on YouTube.